As part of our work engaging Artificial Intelligence and especially Machine learning into Global-Regulation‘s system, we’ve conducted a comparison between the big four providers of ML Text Analytics: Microsoft, Google, IBM and Amazon. This post is a follow up of a previous post regarding AI assisted compliance system. 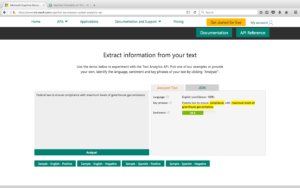 Microsoft – MS ML studio allow some options of text analytics. In MS ML There is a link to new text analytics models but unfortunately it is a broken link. 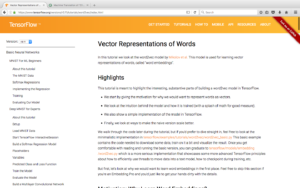 Google – Tensorflow offers some text analytics features. This is not a friendly tool and the text analytics options it does offer are vague. However, the vector representation of words may be useful when analyzing legal text and training a model to identify segments within legislation. This is a different approach than the structured text analytics offered by MS and IBM – see below. In the context of a previous post about AI assisted compliance system, Tensorflow vector representation may be the solution for the first part of the challenge, i.e., manually identifying compliance clauses and training the model with these clauses. Nonetheless, new challenges arises in the implementation stage since the system will be able to identify laws that includes compliance clauses but not the specific clauses within the law. Overcoming this challenge will require an additional stage in which the laws may be broken into chunks of text before running the model to identify the clauses. As laws are not always (and usually not) machine friendly, this process creates its own challenges. 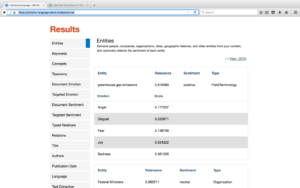 IBM – Now offered through AlchemyLanguage, IBM now have one text analytics feature analyzing entities and relevance. Before migrating the text analytics features in July 2016, IBM offered few options of text analytics that are not available now. This system analyze factor as ‘Fear’, ‘Anger’ and ‘Joy’ – not exactly what one would need to analyze legal text. In addition, IBM’s costumer service does not really work. Attempts to get access to their system failed even after stubborn emails. Finally, it should be mentioned that Amazon’s ML platform does not provide any text analytics options. One would expect that the first step in analyzing legal text would be to use ML text analytics options. This seems like the short way towards identifying segments within legislation and the best way to ride the advancements in this field. However, upon testing these ML text analytics abilities, it becomes clear that this is not the answer and that in their present state of development, ML text analytics is not capable of doing much serious work, rather than classifying text as ‘Joy’ or ‘Anger’. 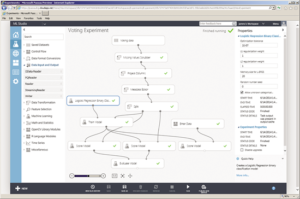 The more ‘simplified’ approach taken by Tensorflow vector representation is much more relevant for the purpose of analyzing legal text and identifying segments in big data even though it is far from the ‘Watson Dream’ where you ‘work with Watson’ and get your text analyzed with the click of the mouse.